I`m just a begginer in unity and i have a little experience working with blender, but this project is realy challenge to do something for me and to learn some things. I want to make an enviroment in cyberpunk style and hope i`ll do it in time. I was inspired by some pictures i found in internet.. Like this one. Made simple plan with cubes of the city street, put some light. 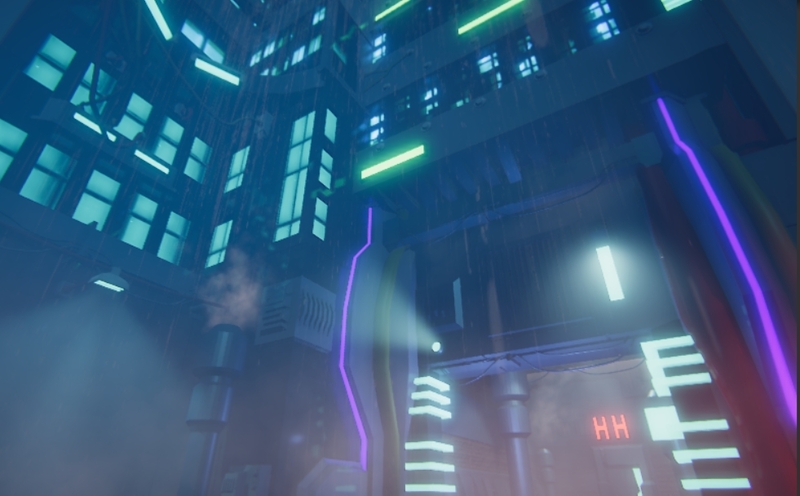 Worked with PostProcessing, made rain and fog for the scene. Made first blender model, put some simple textures in unity. Created second model for the corner building. Planning to make 8-10 more buildings, animated characters and make video through the city with all animations.